Texas sage may not be a true variety of the sage family, but it’s easy to see its appeal. This lovely shrub is drought-resistant, perennial, inexpensive and requires next to no care. It also flowers frequently, bringing a beautiful shade of purple to your garden over and over again. It's actually a member of the figwort family, and is distinct from the other plants in the salvia family. It is most commonly seen as edging in desert gardens in the United States. Click here to read about Russian sage, another non-true type. 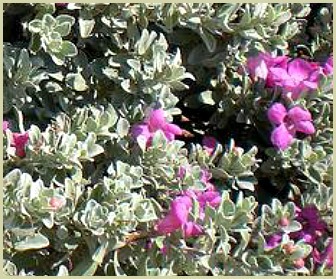 Texas sage grows as a shrub and its Latin name is leucophyllum frutescens. Every variety blossoms every time it rains, so you can force more flowers by giving the plant a few extra waterings! it will bloom after rain from spring through to late summer. It's native to the American Southwest, which shows exactly how resilient and drought-proof it is. Its leaves are small and round in shape, with shades of silvery green to dark green. The shrub can grow to around six feet in height and six feet in width, although plants of up to eight feet are not unheard of. Every variety has bell shaped, or funnel shaped purple flowers, ranging in shades from light mauve to dark purple, and because of these pretty purple flowers; it often goes by the name “purple sage”. Find a sunny spot in your garden. This perennial loves full sunshine and humid conditions. Don’t worry about cold temperatures. It is a desert plant, and can handle overnight lows as cold as 10°F. It's a very slow grower, and trimming from time to time will be helpful in keeping it the size and shape that you want. Pruning is also good for older plants which have grown a bit scraggily. However, there is a warning. Make sure to prune the shrubs in the spring, in late March or early April, and do it when they are not in full flower so you don’t lose the blossoms. Over pruning will affect the shrub’s blooming, so when it's flowering, just let it grow. Plant in soil with good drainage, and let them dry out between waterings. It does well with watering every two to three months in full summer and only once a month during the winter.